Uncover the Sulékó collection in the cozy atmospere of Yuta’s Salon ! Yuta describes her boutique as a friendly club where you bond to celebrate Grace, Beauty and Style. She transformed a classic pre-war townhouse into a space that feels as comfortable as a home and as sophisticated as a designer showroom. Her carefully curated boutique carries timeless pieces as Yuta scours Paris, London and New York for designers whose attention to detail, fine fabrics and workmanship sets apart. Two seamstresses tailor each piece selected by the client so that they fit her like a glove. 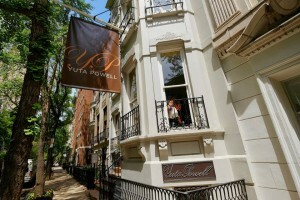 At Yuta Powell it is not about fashion, it is about style and every detail needs to be perfect !